Dublin’s Jewish community reached its apogee at the end of the nineteenth century. It centered around South Circular Road. Indeed, Dubliners nicknamed Warren Street, Martin Street, and Saint Kevin’s Parade “Little Jerusalem”. The Irish Jewish Museum is housed in the old synagogue on Walworth Road. This place of worship was the center of Jewish life in the capital until the movement out to the suburbs and a gradual shrinking of the population led to its closure in the 1970s. In 1985 Chaim Herzog, former president of Israel, gave a speech inaugurating the new museum. It houses archives and objects and depicts the distinctive characteristics of the community. On the first floor, visitors can admire a kitchen ready for a typical Shabbat at the turn of the twentieth century. On the second floor, one can admire the well-preserved synagogue. 52 Upper Clanbrassil Street (Dublin 8) is the birthplace of Leopold Bloom, one of the two protagonists of Ulysses, the 1922 masterpiece by James Joyce (1880-1941). Bloom was the son of a Hungarian Jew who emigrated to Dublin and changed his name. A plaque on the wall recalls his presence here. Ulysses also mentions Emorville Square, Lombard Street West, and Saint Kevin’s Parade. Bloom has become such a popular character that Ireland’s main literary festival is named after him: Bloomsdays is held every year on 16 June. For more information, contact the James Joyce Centre. The synagogue on Adelaide Road, which was consecrated in 1892, closed in June 1999. Another, Greenville Hall, built in 1920, is now home to a high-tech company. The Greek columns and Stars of David that decorate the exterior can still be admired. 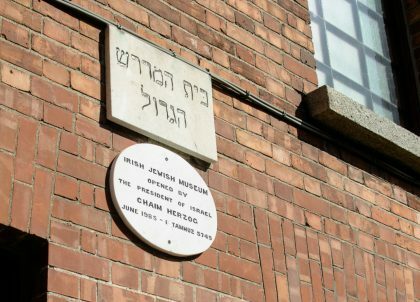 Two active synagogues remain: the Dublin Hebrew Congregation, and the Machzikei Hadass Synagogue; the time of services can be obtained from the Jewish Community Centre at Herzog House. The last burial at Ballybough cemetery was in 1908, but the Jewish community has continuously employed a guardian to take care of the site since then. 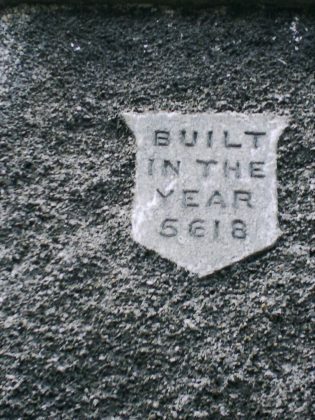 An inscription on the guardian’s lodge, at the entrance to the cemetery, reads “Built in the year 5618”. Dublin’s Jews are buried at Dolphins Barn cemetery, not far from the Donore Avenue Bridge over the Grand Canal.